BELAGAVI, Apr.12: Although nestled along the eastern side of the Western Ghats, the grand old mountain ranges of the peninsular India with rich biodiversity and three major rivers viz. Krishna, Malaprabha and Ghataprabha and their tributaries flowing through the district, several parts of Belagavi taluk and district have been facing drought conditions; thanks to widespread visible destruction of the green cover to pave way for horizontal expansion of its towns and cities. 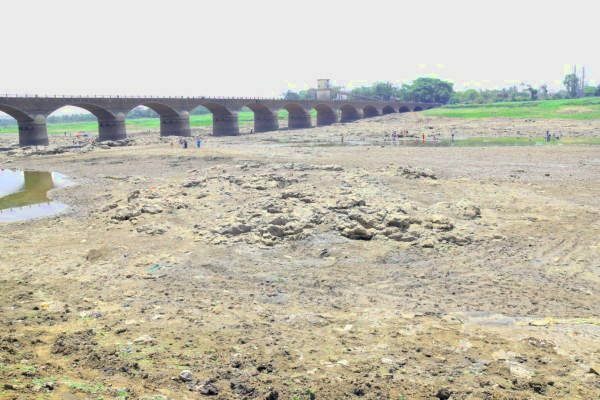 A view of dried-up Krishna river near Kudachi of Raibag taluk. Almost all the rivers, lakes and reservoirs have accumulated silt over the years, directly impacting storage levels. However, in a belated measure, the government has taken up works to remove the silt from some of the rivers, nalas and lakes under the MGNREGA works since last year. Yet, there is a long way to go to achieve the desired results. Apparently, droughts are both a natural calamity and a man-made disaster of sort. This year, all the ten taluks of district are in the grip of drought for the third consecutive year, even State government observed as one of the worst droughts being witnessed in about 165 taluks across Karnataka in the past three decades. Water storage levels in dams and reservoirs have receded, rivers and nalas dried up at several places along their course, and the prevailing temperature is bound to evaporate these water bodies to pathetic levels soon. As of now, as many as 38 villages in the district are facing severe shortage of drinking water, forcing the district administration to engage tankers to supply water from nearby sources. However, Deputy Commissioner N. Jayaram claimed that around 3,300 drinking water supply works, taken up as part of relief measures, had been completed Also, 24 fodder banks and five goshalas have been opened for cattle. Principal Secretary of the Department of Water Resources and Secretary In-charge of Belagavi district Rakesh Singh, who reviewed relief measures taken by the district administration at D.C. Office on Tuesday, maintained that there was no dearth of funds with the government to tackle drought and advised concerned officials to do their best to minimise the impact of this calamity to the extent possible. He also assured of taking up measures to get water from upper streams of Krishna and it’s tributaries in Maharashtra.